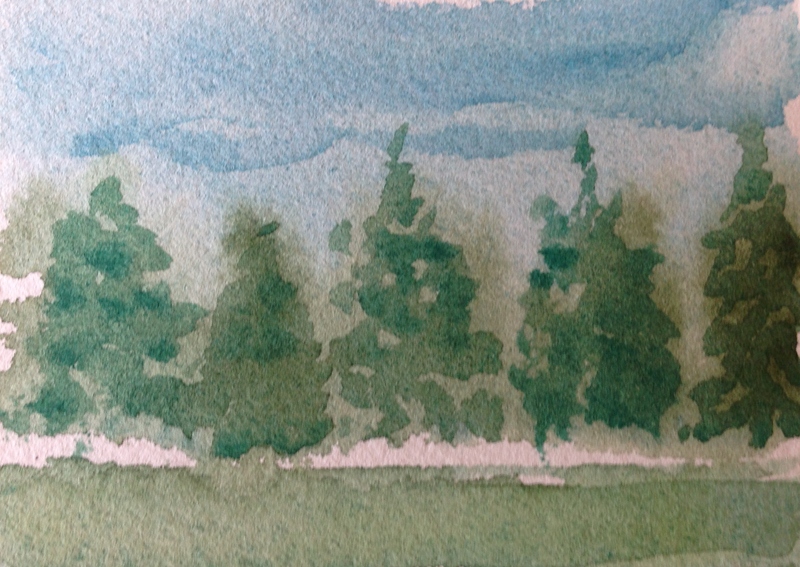 I decided to play with some greens for the letter J, and created a few small (business card sized) watercolor paintings. I do plan to work larger, eventually. Brought to you mostly by WN cobalt turquoise and MG Viridian with cobalt blue and ultramarine blue (and a few minor players, like sap green) thrown in too. Evocative landscapes. Like miniature worlds! Thanks! I really like the small pieces of paper. Takes the pressure off. Feels more like fun! Maybe I’ll try it. I’ve done no painting for a long time. Although it’s more that I have to clear a space and get the paints out of the closet…I know, that’s just an excuse. Maybe when I get back. Ooh I hope you do. I know what you mean though. My stuff is accessible now but when it wasn’t it did seem like kind of an ordeal. It’s so zen tho. Have a nice weekend! Thanks, Karen! I could paint on those little pieces of paper for hours. :)) Glad you enjoyed it. Thanks, Jennifer! Takes the pressure away! these are so simple, yet so beautiful. Especially the first one. I pondered on it quite a while. Simplicity can be so complex. Happy FRIDAY!!!!!!! I can’t imagine painting something so small as a business card!! Incredibly impressive! Thank you so much! You’d be amazed at how easy it is, particularly with a small brush. I actually watched a two-hour video describing various techniques to use with small pieces. I need to adopt many more of them to give the pieces more depth. But these simple ones I do are really easy! 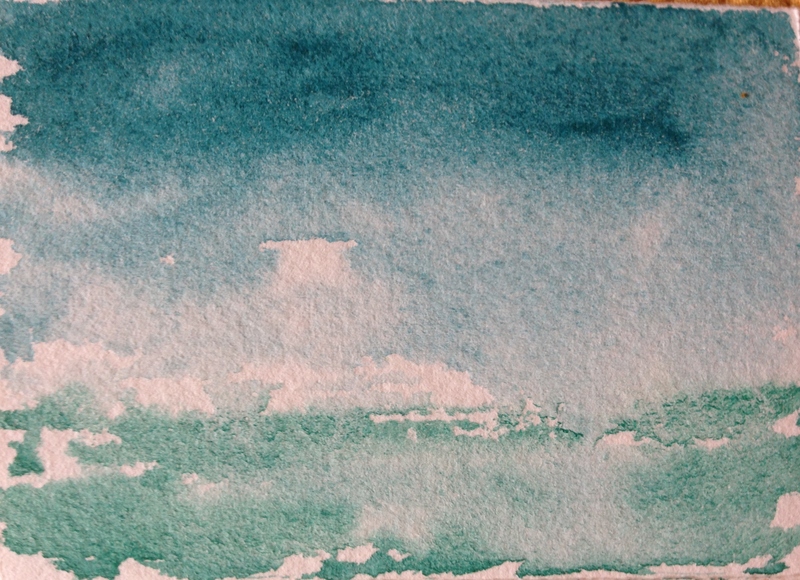 Watercolor does a lot of the work for you. Glad you enjoyed them! These are sweet. I love the business card idea. I could see an entire blue-green nature series like this. I think I have a bundle somewhere myself. I know, right? Or all clouds or all trees…. Oh yes, these worked! I especially love the first picture. 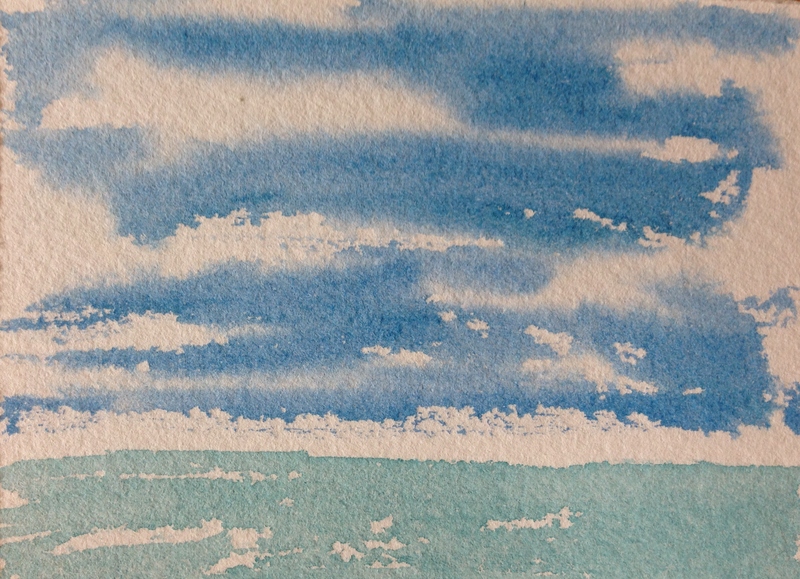 So watercoloury! Those are beautiful watercolors! I really like them a lot. wonderful use of colors. Isn’t cobalt turquoise a fun color? It’s awesome, Carol, thanks! Do you have any other greens or blues you especially like? Great pine trees!! Also, that was a really pretty shade of green!! On a side note, would you be interested in painting or drawing a really neat dragonfly shot I got? I have a twelve spotted-skimmer pic that I took and I think it would look really cool drawn! If you were interested, I would obviously do a separate post recognizing you for your efforts and linking people to your blog. Ok, yeah I can totally get you a link! If it ends up being too hard, then I’ll totally understand!! 🙂 Feel free to let me know if it is too hard and you need to stop. If you go onto my blog, go to the “Stubborn Turtles and Curious Bears” post and scroll through the pics till you find it. Then you can just click on the picture and print it out or download it. If I’m unclear or you can’t find it, then just let me know and I’ll give you an email with the pic. Ok I saw it…..it’s a great photo, BTW. Not sure I’m ready for it yet, though. Maybe in a couple of months. Lots of detail in the wings. Not even sure how to attempt it. The bear would be easier hehe. Haha!! That’s more than ok! I was wondering if it would be too hard… I don’t even want to think what my drawing would look like if I tried. Feel free to do the bear if you want! Just know that I didn’t take that picture, but it would still look REALLY cool drawn! You should try the dragonfly! It’s always easier to draw something (IMO) if you’re really drawn to the subject. The only flying things I’m drawn to are birds and butterflies, lol. Haha! Birds and butterflies, nice! lol, I’m not so sure i trust myself to actually give it decent wings and stuff, but I’m gonna do it for the heck of it, and if it doesn’t look like it was drawn by a toddler :D, then I’ll post it. Awesome! I have a question for you. Are you a naturalist (or training to be one)? Wondering why you’re tracking animals (or learning how to track them)? Yeah, you could say I’m a beginning naturalist. I’m currently studying in depth how to track and how to thrive in nature 😀 lol, not just survive. Wildlife tracking and fooling around in the woods is always very fun for me, so I would definitely consider myself a naturalist even though I’m not even 18 yet. Are you one? Also, no pressure or anything, just curious, why were you wondering if I was a naturalist? I thought maybe you were a hunter at first lol. HAHA!! Lol, I’m just now getting into hunting and I will be hunting a deer this fall with my dad, but no, I don’t do any major hunting. I will try to only do that when I’m actually camping, besides deer. They are extremely valuable and getting a deer every fall will be extremely helpful long term, with a few uses being: being able to make sinew, have antler, make neat’s foot oil, make buckskin, and a ton of other uses. Do you know much about naturalist stuff and where did you hear about naturalism? I know many people who had NO CLUE what a naturalist was until I told em. Also, do you do any kind of nature observation? Other than a fiction book I read in which one of the characters was a park ranger (I think), I don’t know much, Evan. I’m sure you know way more than I do. I’m interested in animals because I like drawing them (and would love to be able to realistically paint them). That’s about it. I admire people like John Muir Laws, who brings his appreciation for animals into the artistic realm. Have you read any of his books? No, I haven’t read any of his books, but I also admire John Muir a lot! He was a great guy!! Well this reply spanned waaay longer than I thought it would :), thanks anyway for thinking about drawing that dragonfly! Maybe I can get something a bit easier in the future! Haha yeah. I may be thinking of the son. Maybe it’s John Muir Laws. He goes by Jack. I believe he’s middle aged and still alive. My mom got me a watercolor instruction book called, “Work Small, Learn Big.” Really expanded my thought process on benefits of working from smaller sketches/studies like thumbnails. Things like composition and color scheme are easier to see also when you’re working smaller. Really digging these ones. Hope to see you revisit this in the future. I’m working now. Look for the letter N coming up! Thanks for that book reference and tip too, Jesse. Love them, Laura, especially the first one! What a beautiful sky and sea!!! Just saw it and commented. 😊 Have a wonderful day, Laura!! !